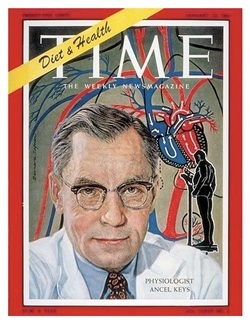 Ancel Keys - was a physiologist who studied human nutrition. He is the father of the modern health recommendations for diet. You know, the diet that tells us fat is bad for us. The basis for this claim is the study he did called "The Six Countries Study". (Sometimes this is referred to as the Seven Countries Study - it depends which part of the Interwebs you happen to be Googling at the time.) Turns out that there were really twenty two countries in the study but he only included the ones that seemed to show a link between animal fat consumption and heart disease. It seems that there is no link that can be established between fat in the diet and cardiovascular disease. So why do our doctors tell us that our "arteries are being clogged up by the fat we ingest"? We had one tell us this during the week. It has been the main impetus for this website! "A group of scientists recently went back and evaluated the Sydney Diet Heart Study, which was a a single blinded, parallel group, randomized controlled trial. The data showed that instead of reducing heart disease risk, replacing saturated fats with polyunsaturated fats INCREASED risk for heart disease." The China Study (there you go, I've provided a Wikipedia link for you), is famously known to point the finger at diets like the Atkins. It has been called the "Grand Prix of Epidemiology" by the New York Times. It would appear to be the holy grail of vegans and vegetarians. I think I might have to go eat a carrot right now! If that isn't enough, here is the final nail in the China Study coffin. It turns out that a new analysis of eight studies shows that if Asians eat more red meat they have an inverse association with CVD mortality if they are men and a similar association with cancer mortality if they happen to be women. It seems that ditching the carbs could well be a good idea for preventing or even slowing down this terrible condition. As long as your ancestry has had a long history of agriculture, you have a good chance of carrying the right genes to help you tolerate carbs to the extent that your brain can cope with them. On the other hand, however, if you are descended fairly recently from a 'hunter-gatherer' society, the apoE4 gene may not have been weeded out of your particular pool. Presence of this gene in combination with a high carbohydrate diet looks like a risk factor for AD. 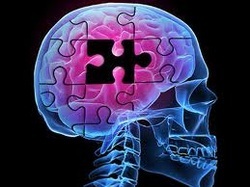 "Research into the possibility of using presenilin-inhibitors as drugs to treat Alzheimer's should be regarded as yet another nail in the coffin of the amyloid hypothesis, which, as Dr. Koudinov has tirelessly pointed out, is being supported by researchers who continually violate institutional standards in failing to disclose information about their conflicting financial interests." No wonder the word of very low carbohydrate ketogenic diets is taking a while to get out. You have to pay $45 to purchase an article about it from the British Journal of Nutrition. At least you can read the abstract for free. On the other hand, good old Wikipedia has a wiki on Medical research related to low-carbohydrate diets that lists 35 studies that report on the efficacy or otherwise of low carbohydrae diets. Some of them were looking for the wrong things, I notice, and instead of looking at low carb. high fat diets they pointed out dangers in low carb. high protein diets (which we all know we should keep away from). Many of them show a bias based on some of the current mainstream thinking at the time eg. the belief that high fat diet correlates to increased cardiac risk (which we now all know is incorrect). Here is a study specifically testing a ketogenic diet for obese patients. Speaks for itself. Another study showing effects of low carbohydrate diet in the long term. Richard Feinman writes an article on the dangers of carbohydrate restricted diets here. Vegetarians have smaller brains - Well, tell me something I didn't know! The effect of low carbohydrate diets on some cancers is described in a scientific paper/experiment here. The experiment is basically inducing cancer in mice, feeding some on low CHO and some on high CHO and observing what happens.